Is Russia finally catching up with the West when it comes to drone technology? Russian Deputy Defense Minister Yuri Borisov recently announced that a new long-range unmanned aerial vehicle (UAV) will soon be made in Russia, according to Sputnik News. The article further notes that this new drone will be able to conduct reconnaissance missions and also be capable of attacking targets. “We are finalizing research and development work related to the drones that will solve an array of tactical, operational and strategic tasks,” the deputy defense minister elaborates. 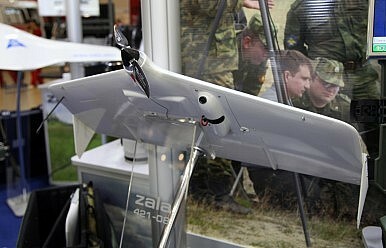 He further notes that this new combat drone, developed by several Russian aviation firms, including Sukhoi and Tranzas, will be used by the Russian Defense Ministry and the Federal Security Service (FSB). However, Borisov refused to provide the public with technical characteristics of this latest addition to Russia’s burgeoning UAV program. In 2012, Vladimir Putin announced that “unpiloted aircraft are being used more and more actively in armed conflicts; and I must say, they are being used effectively.” He added, “[W]e need the full line, including automated strike aircraft, reconnaissance drones and other systems… It is imperative to involve best engineering and science bureaus and centers in this effort.” Russia has allocated around $12 billion through 2020 for its UAV development program, which appears to be gaining momentum as of late (e.g., the Altius 001 UAV). In November 2014, Russia also announced that it will build a drone base for military reconnaissance just 420 miles off mainland Alaska. On January 23, Russia Today broadcasted that the Russian United Instrument Corporation (UIC) (a branch of Rostec Corporation) has constructed two prototypes of the “Chirok” drone, a hybrid amphibious UAV for civilian and military use, and is prepping them for test flights. The article notes that this new drone may first appear in public at the MAKS-2015 air show at Zhukovsky Airfield near Moscow on August 25-30. Russia Today notes the Chirok’s “outstanding stealth capability” and states that the drone has “enough inner space to fit the weapons, such as small-size guided missiles or high precision bombs, internally, so that they won’t interfere with aerodynamics and stealth characteristics.” The operable range is 2,500 km, and the maximum cruising altitude is reported to be 6,000 meters. The drone also needs no runway for take-off. Overall, Russia’s UAV program still lags behind Western efforts in this field and it will take a few more years for Moscow to catch up. “Russia and China’s capabilities are quickly developing. By the end of the decade, if certainly not before, we have intel that shows they’ll have the potential to develop the capability to produce a predator drone on par with American standards,” notes a IHS Jane’s analyst in an article for The Guardian. The head of Rostec recently alleged that the T-14 'Armata' has entered serial production.